A lot of research has showed us that strength training provides us with a lot of positive effects on our brain and a certain mental health conditions are improved. So let’s look at how it all works and how a physical based training program improves our mental state. The result of research has shown that low-moderate intensity strength training can reduce anxiety in individuals that do not have an anxiety disorder. However, more is not always better for us as was show in another study that high intensity training did not produce as good results what low-moderate training did. If you have osteoarthritis and lower back pain and you complete strength training, this is better for you and will minimize the effects of both problems more than if you were to complete just aerobic exercise or both aerobic and strength training together. If you suffer from knee or hip osteoarthritis, strength training has shown to be the best type of exercise to reduce the pain. In older adults that complete strength training, studies have shown improvement in cognitive-type brain functions. However, greater improvement was shown if these older adults completed both aerobic and strength training, which is the opposite to the chronic pain studies mentioned above. We are aware that any form of exercise is great for reducing depression, however strength training by itself has shown the best improvement, more so than if you combine aerobic and strength training together. Regarding depression, in younger healthier adults, their results showed an even greater improvement than the older adults. Strength training on its own has shown more improvement than any drug treatment or cognitive behavioural treatment for improving fatigue. Many of us may think that completing any sort of exercise would make us more fatigued but it is actually the total opposite! 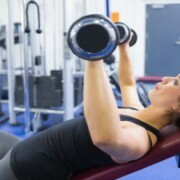 If you complete low-moderate strength training you are going to tone and define your muscles. You will also be able to regulate your weight better and in general you will look and feel a lot healthier and better within yourself. Everybody knows that if you look better, you will feel better! Results from sleep studies have shown that you will get a better sleep if you complete high intensity training rather than low-moderate. However, it is worth completing any sort of strength training if you have trouble falling asleep as this can still benefit you. The benefits that we get psychologically from strength training come from improved neural adaptions or how your brain activates muscles and the more training you do, the more these connections seem to improve.